Front tine rototillers are best used in smaller spaces where the soil is not completely dry and compact. They are generally less expensive than a rear tine rototiller but not as easy to use. Examine the area to be tilled closely to choose the correct tiller for the job. With the proper tiller, a project can be completed in half the time and effort than spading, creating a smoother surface with less work. 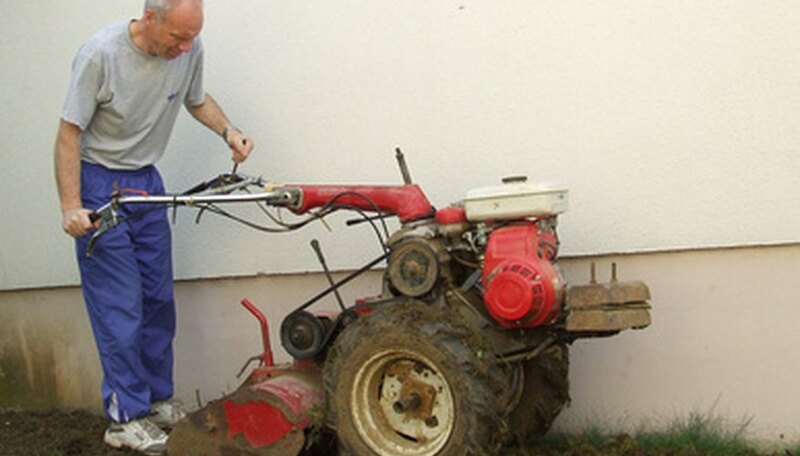 Adjust the height of the rototiller handle to better fit your body. You should be able to stand erect without slumping when operating the machine. Most rototillers are gas powered, making them easy to start. Fill the tank with the recommended variety of gas. Prime the engine by pushing the primer button three or four times. Turn the throttle switch located near the handle to open. Hold the handle firmly with one hand and pull the start cord with the other to start the engine. Position the rototiller at the corner of the area to be tilled. Engage the tines, holding the handle firmly. It will require some strength to begin the tilling process in hardened soil. The soil can be watered before beginning to soften the soil. Begin walking along the area to be tilled in straight lines. The rototiller will have to be forcibly pushed until the tines begin to dig into the soil. Continue walking in paths with the rototiller until the entire area is complete. The rototiller may jump when striking larger clumps or rocks in the soil. Keep a firm hold on the handle to maintain control of the machine. Turn the engine off once the entire area has been tilled. Turn the throttle switch to close to turn off the rototiller. Disengage the spark plug by removing the spark plug wire from the plug. This will ensure the machine will not start during the cleaning process. With a gloved hand, clear away any debris and dirt that may be clogging the tines of the tiller. Always wear sturdy shoes when operating a rototiller. Always disengage the engine before placing your hands near the blades.